Changing a dust collector’s filter cartridges or baghouse’s filters too early adds unnecessary expense and takes up maintenance time that could be better spent on more urgent tasks. Changing a filter too late runs the risk of exposing workers in the facility to hazardous dust and the potential for fires or explosions. Also, as the filter becomes increasingly clogged, energy costs for the compressed air needed to run the system will rise, as will the stress on the dust collection system’s fans, bearings, etc. So how can you identify the “ Sweet Spot” that’s neither too early nor too late but “just right”? The most obvious sign of a damaged filter is dust streaming out from the collector’s exhaust or building up in clean-air plenums. A sudden, rapid drop in differential pressure is another clear indication of a damaged filter, which makes monitoring and plotting the differential pressure level on a daily basis crucial. When choosing a system, consider adding a broken bag sensor. In addition to obvious upset conditions like a fire or explosion, many things can damage a filter. Moisture and excessive heat can damage common filter bag fabrics such as polyester or aramid through a phenomenon called hydrolysis. This is a chemical reaction in which water reacts with the fibers of the filter bags and may cause serious damage, causing the bags to lose dimensional stability and fail to collect the dust. Other failure mechanisms include mechanical wear from abrasive dusts, overpulsing, or damaged cages. The most common reason you’ll need to change your filters is filter blinding. This means that the bag has reached the end of its usable life. It has become depth-loaded with dust and periodic cleaning cycles will no longer remove enough dust to allow it to handle the required level of airflow. New filters have a relatively low differential pressure between the “clean” side and the “dirty” side. It builds slowly over time. As the filter approaches its end of life, the differential pressure will increase more rapidly. For guidance on the correct start-up procedure after installing a new filter to maximize its life, watch our Start-up Procedure for a Dust Collector or Bag House video. The length of a filter’s usable life depends on a variety of factors, including the type of dust it handles, the moisture/chemical composition of the gas stream, humidity, and operating conditions, etc. Many dust collector buyers fail to factor in the required filter change frequency when specifying a system. It’s always advisable to confer with a dust collection specialist and share all the information available on application and site conditions, including temperature, humidity and hours of continuous operation, as well as the type and amount of dust, before specifying both the system itself and filter media used with it. Many base their filter selections on cost without determining if the filter media is appropriate for the application. Improperly sized third-party filter bags will not perform optimally. The filter media might not have the correct temperature or chemical rating for the application. If this is the case, it generally doesn’t take long for problems to emerge. Look for dust emerging from the stack or for telltale readings from the collector’s particulate monitoring system. Types of Filter Media for Filter Bag Construction: This comprehensive list of common filter bag fabrics includes information about types of finishes, fabric weights and application recommendations. Fabric Filter Properties: Learn which fabrics are most effective and efficient for your application and operating conditions. Chemical Compatibility of Fabrics: This chart shows which fabrics are compatible with the chemicals and temperatures you may be using in your application. Filter Bag Finishes: Various finish treatments can greatly improve filter life, dust cake release, resistance to abrasion, static dissipation and protection from harsh application conditions. Installation of a Top Load Industrial Cloth Filter Bag. Installation of a Bottom Load / Side Bag Removal Industrial Cloth Filter Bag. Sly Envelope Bag Change-out Instructions. 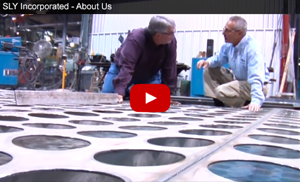 Sly works closely with its customers to design and maintain their dust collection systems. With nearly 150 years of experience, Sly, Inc., is your trusted resource for dust collection solutions. Contact Sly today for information or a quote on any industrial filtration product.